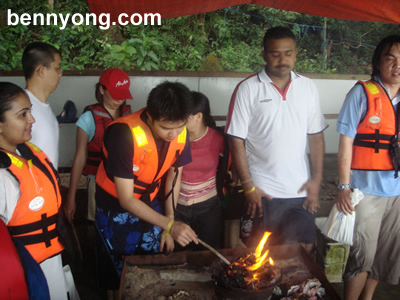 The adventure continued on with different tasks on another two islands including the Island of the Pregnant Maiden (Pulau Daya Bunting)Ã‚Â before we headed back to the hotel. Something worth mentioning is that the weather conditions were so poor until we had to make a delay our boat ride and make a detour to a nearby port before making the remaining journey back by land. After lunch, the day continued with telematch games on the seaside and eventually, team Yellow emerged as champions! 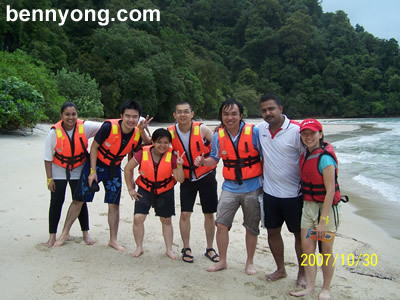 The day started out at a slow pace to achieve the key objective of this trip to Langkawi. Straight after breakfeast, we were all gathered at the meeting room whereby we started to set the mood for the day with a quick ice breaker session among all. Although we do know each other, it was nice to know a little bit more. Before I forget, we were all dressed up in our nicely customized team t-shirts! Ã‚Â We reviewed through the performance of the year and openly discussed any key areas that was raised. It was a very interactive slot that I found to be very useful. Before we knew it, it was already lunchtime. We were given assignments to present on our projected targets for the followingÃ‚Â year and was scheduled to present it later the day. Before I knew it, lunch was over and although I was one of the last in the line to present, eventually, my time came. It was a very thought provoking session whereby I have to justify every single word that I have shown. Well, it did went on smoothly and I believe I managed the crowd and questions well. After months of discussions and planning, it was finally time for the department's teambuilding event. 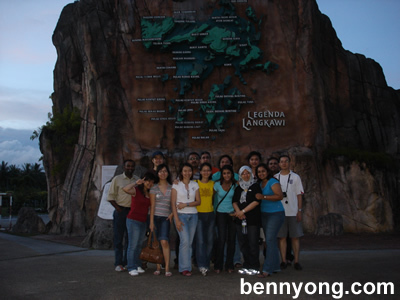 The location of choice this time around is Langkawi. I am very excited as I have never been to one. Well, the flight there was decent and we arrive close to noon whereby we had lunch at Sri Orchid restaurant. This is when the seafood feast officially begin. After heading back to the airport to fetch the remaining group, we took the chance for sight seeing. 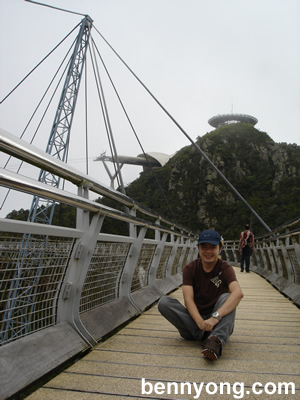 We headed to the cable car and went up to the peak where the scenic suspension brigde was. It was a bit too misty but being up there was an experience. 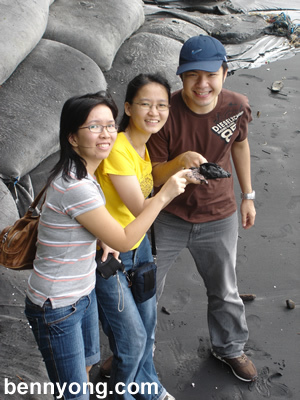 After that, we took a drive to Kuah Town whereby we had a pit stop at The Black Sand Beach. To be honest it looked like a poluted strecth of sand. Examining it close up proves it to be fined sand. After a shopping spree at Kuah Town, we headed to Dataran Lang whereby we quickly pose for a team picture at the Legend's Park which was a stone throw away. We soon checked into Sheraton Hotel and called it a day. That's all the highlight of the day and stay tune for reports of the next three days and two nights. 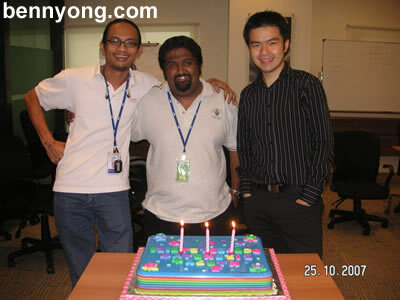 In the office today, it is my turn to join in the on going monthlyÃ‚Â team birthday celebrations. Ã‚Â There was abundance of food to eat and the most amazing one was the Jelly Cake which looked like plastic. There was a mix of flourescent colours. The alphabets read "Happy Birthday October Babies" and look like an arrangements of blocksÃ‚Â used inÃ‚Â nurseries. I swear the cakeÃ‚Â will glow in the dark if we switch off the lights. Regardless, it did taste very good.Ã‚Â I took a huge slice home to share with my family.Ã‚Â Ã‚Â Well, it has been a great week for me so far and I can't wait to be in Langkawi for the early part of next week. Ã‚Â Stay tune for more updates! If you ever dreamt about working or livingÃ‚Â in the states, make it happen by submitting your application for theÃ‚Â Diversity Visa Program. This allows minority migrants to apply to get a Green CardÃ‚Â that will allow you toÃ‚Â stay and live there.Ã‚Â The official site is http://www.dvlottery.state.gov/. It is free to enter and the submission for 2009 entry are closing on December. Uncle Sam has restrictions on certain nations but Malaysia is cool. Did you know that there are scam sites that charge for such services?Ã‚Â They will compile your submission and charge you a fee to submit it to the above link. Well, might be a business idea for you but why make this type of living whenÃ‚Â there is so much else to do. - key in the 1st 3 digits of your phone number (not the 01X) onto the calculator. - Add the last 4 digit of your mobile phone number. - Again, Add the last 4 digit of your mobile phone number. Look at the results. It should show your phone number...interesting!! One of the coolest thing ever but I believe it should work with any random 7 digits I guess but haven't tried. The movie of choice was the Last Legion because the trailer seems promising and Aishwarya Rai was in the movie as well. Set in Roman times, it tells the tale of evacuating a young Caesar to Britannia for refuge after the empire was attacked by a strong force of the Barbarian King. All allies of the Roman Empire has turn down their support to the young and they are left to defend themselves against a raging army of barbarian. Aishwarya Rai stars as Mira, a middle east warrior that assigned to help out. DonÃ¢â‚¬â„¢t let the story board or spoiler as the movie failed to bring the novel to life. The whole movie seems amateurish and it wasnÃ¢â‚¬â„¢t the best acting ever displayed. A quick search on reviews of the movie revealed that my take is consistent with industry critics. The fighting scenes were poorly choreographed and the angles used to film the scenes were bad. I am never too picky about movies which indicate that this is filmed in an intolerable level. As a summary, it is thumbs and toes down. Give this movie a miss and download it (legally of course :)) instead and keep it for those sleepless nights. You can thank me later for this piece of advise. The website itself is as disappointing as the movie. Only an image file with a link to the trailer. Check it out for yourself. Well, let us hope that if there is ever going to be a sequel to the movie (the ending seem to indicate such) for it to improve greatly. ThatÃ¢â‚¬â„¢s all for now. Bye all. I am totally spoiled for this weekend with a non stop celebration of over 4 days for my birthday. I am sure it will all end today though. 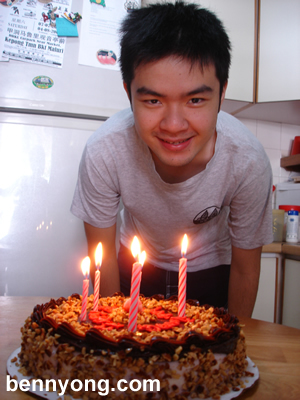 However, I woke up this morningÃ‚Â (check out my messy yet stylish hair)Ã‚Â to blow out candles of an ice cream cake that we got off from Baskin & Robbins in 1-Utama. The cake tasted marvelous and was very rich. 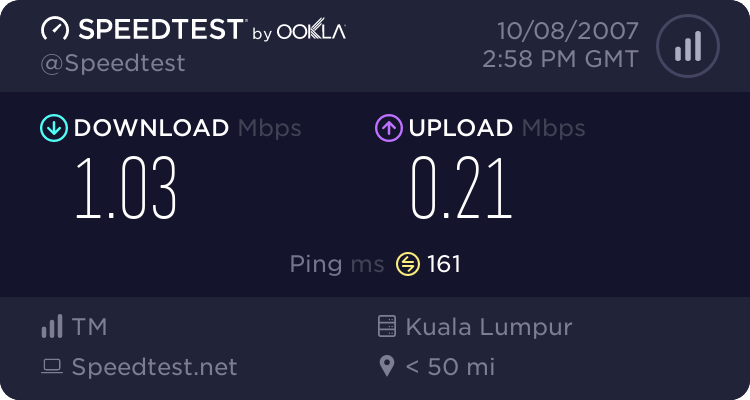 Later in the day, I went to Cheras for lunch and was back home to start installing my wireless router that I bought yesterday from the digital mall. I first setup my UPS whereby my cables still needs some tidying. The wireless router from Net Gear certainly had better installation guides than Aztech. The installation took less than 20 minutes and now my whole house is finally coveredÃ‚Â with wi-fi. A final end to my struggle of getting theÃ‚Â wireless connection up (due to my procrastination as well :)). Can't believe the long weekend is now over and can't wait for what is in store for the week. My modem went dead after the heavy rain and I remain puzzled to what has happened as everything was connected through a power surge protector. I later realized that the source could have been through my phone line instead. It was no harm as I wanted to replace my faulty wireless modem and router from Aztech anyways. It was already in the pipeline to drop by the Digital Mall in PJÃ‚Â SS14 to get new hard disks and getting some additional gadgets should be no harm. The place itself was no different from Low Yat Plaza and the drive there was certainly more pleasant. There were countless of floors with techie goods and my all timeÃ‚Â favourite IT Hypermart All I.T was situated on the top floor. I am always impress by the amount of stock they keep and it being displayed openly instead of asking someone over the counter like many other computer shops do. This outlet is definately a blessing as I hate driving all the way to Low Yat in the city center where it was the first All I.T I visited. The only thing I disagree with the whole mall is the shops that charges consumersÃ‚Â an additional 2% for paying with credit cards. I believe the sellers should take on the costs and not the consumers. I know there are certain merchant costs involved but if I were to run a business, I would calculate it in a way whereby I would absorb the costs and not my customers. I agree thatÃ‚Â there are rooms for arguments here but aren't we moving towards a cashless environment whereby transactions through card should exceed spending cash like many advance countries? Well, enough said before I get to deep into my views. I can't wait to install my newly acquired purchases. What would be a better plan than Melaka to kick start the long weekend. I had mixed feelings on how the traffic would be like because of the holidays but braving it turned out to be well worth it because it was smooth sailing all the way. The traffic reports of it being jammed packed in the wee hours might have resulted the roads to be clear on the first day of the Hari Raya celebrations. The drive to Melaka took about just under two hours whereby I finally saw MMU after hearing so much about it. 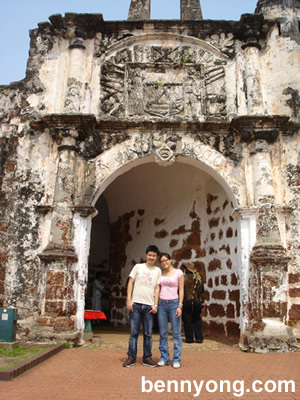 I picked up Song YiaÃ¢â‚¬â„¢s brother and friend before heading to the city center for A Famosa. There were not much additions since I was last here about 4 years ago but the only difference was I am now behind the wheels guided by a local. It is also worth mentioning the newly discovered wall of the old fort which is just a stone throw away. There are plans to reconstruct the whole wall to itÃ¢â‚¬â„¢s original setting. LetÃ¢â‚¬â„¢s see how long that will take. The weather which was perfect for walking did not last long and we had to seek shelter in McDonalds opposite Melaka Zoo. Looking at the rain which did not showed any signs of slowing down, we gave up and headed back to our newly made friendÃ¢â‚¬â„¢s house to watch Apocalypto directed by Mel Gibson. After a short nap and refreshing shower, it was time for dinner. 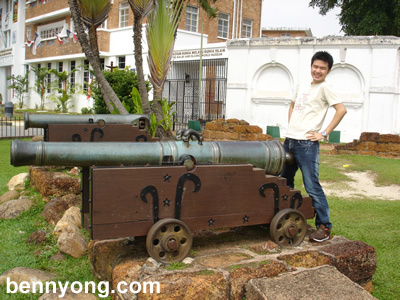 We headed to the Portuguese Settlement for food along the beach front stalls. The food was of decent quality and price. After dinner, we hanged out at Wings Music CafÃƒÂ© before making our drive home to KL. All and all, it was another day well spent! I arrived in the office to be greeted by decorations on my desk with my pictures imposed on different characters. (Thanks to my dearest Song Yia for all the hard work). It was certainly a great start to a very eventful day. 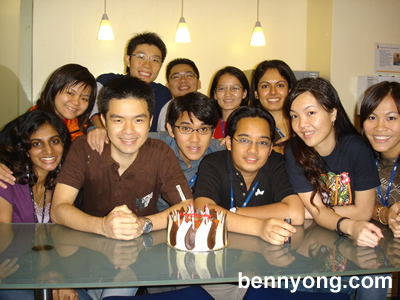 Soon before noon, we all gathered at the pantry for the birthday cake. It was a cheese cake which tasted very light which was perfect for the stomach before lunchtime. We headed to our usual place in Kuchai Lama called Big Tree because where the eating place was under. We all feasted on a variety of dishes. It was surely very heart warming to see the whole bunch of amazing friends there and what a privellege it is to be working together with them. I always live by the principle of friends work better which is definately a bonus especially in the organization that I am in. It was back in the office later whereby all my presentations and conference calls went on well. We soon headed to Daorae in Puchong for Korean BBQ. It is my second time but I am glad that JC came along as she finally made sense on how to dine. My family and I were at the same restaurant but the Taipan outlet and were clueless on what we were doing there. Regardless, the service we received was of unmatchable and the staff genuinely seemed polite and happy. Looking back at the day, it is scary that 1 year has passed and I can proudly say that it was a good year spent. No regrets! Just for fun, this post was what it was like a year ago. I heard the door bell and there it was the rider for the parcel company, GDex. He mentioned my name and I nod as acknowledgement. There it was on his hands, a parcel with my name on it. I instantly knew it was a prize from Astro looking at the address of its origin. I quickly ran in the house to open it up and there it came, Amy Winehouse's album Back To Black (Malaysian Edition) worth RM 29.90 from Universal. I was trying to recall which competition that I have participated as I haven't been that active in the arena lately. The only ones I know of are from radio sites whereby lead me to discover the following page on Mix.fm website. Although the value of the prize is small, it did cheered up my day. It is like an early birthday gift. It has been ages since I won any contests and I believe this is a start to the many more amazing competitions that I am going to win. My friends at the office was talking about this over lunch sometime back. I also had the chance to see their blog post on the topic which attracted me. The website made to promote the upcoming movie The Golden Compass due to be released in Dec is using a smart way to reinforce it's campaign. They are having a some sort of personality test that will apparently generate your daemon that matches to your answers. Funnily enough, I did it the last time and the results matched the second time although I believe there were varations in my responses. They ask you a string of 20 questions and there are logical calculations behind that will determine your daemon. In my casual browsing over the weekend, I discovered Joost. Joost is a system for distributing TV shows and other forms of video over the Web using peer-to-peer TV technology, created by Niklas ZennstrÃƒÂ¶m and Janus Friis (founders of Skype and Kazaa). Apparently the Tycoon Li Ka Shing has a stake in the company as well. The application is ad supported and have a very Web 2.0 feel to it. Navigation takes a while to get used to but once you get a hang on it, everything is simple. I can imagine this application running on all TVs one day. In the world of Web 2.0, I believe this website is one of the best and as always free is good. Well, if you do not intend to install anything on your machine, there are tons of video and movie sites out there such as CoolStreaming.us below. My PC has been making a strong and fairly loud noise lately. Well, to be honest for about more than a year since I was living in the apartments in Bukit Jalil. It never use to bother me because the PC was left out in the hall and no one sleeps there. Ã‚Â Since moving to USJ, the PC has been setup in my room and the noise was becoming a nuisance. Although I tolerated it and was able to sleep, my mum somewhat believed that it did affected me in some ways. It is really uncanny but I think it did affected me to some extent. Oh well, my room got repainted recently because of some wet spots and everything in my room have to be moved out. Although not favourable as I have to resort bunking in with my sis, it brought to me more benefits than ever. I took it as an opportunity to tidy my room and solve the long due problem of the mysterious noise originating from my PC. A mail I received which I thought was worth sharing with some easter eggs in Microsoft's application. Try them out and see it for yourself. is it just a really weird bug? :-?? At Microsoft the whole Team, including Bill Gates, couldn't answer why this happened! I'll make this a quick post. copy of the report they give away. cents for each copy your referrals give away. 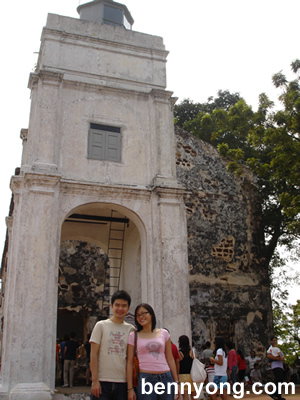 Well, I just got home earlier today after a quick trip back to my sweet hometown, Penang. Driving along the highway, I recall the earlier days when I started getting my hands deep down and dirty in web designing. I was mesmerizing the days when a new html code or dhtml scripts that I just learned wouldÃ‚Â keep me happy for hours. There was also website that I was obsessed with when I first found out about it. It is called flamingtext.com which allows you to generate flaming effects with any text that you specify. Besides the resident flaming effect, there are a whole lot of other fonts available and cool features that you may add to them such as aÃ‚Â stained glass effect. There are glowing and shadow effects. I know that you can get this done easily in Photoshop or Fireworks but it is a cool web based generator application powered by CGI. On theÃ‚Â plus side,Ã‚Â you may access this website from any PC and a logo or fancy text generated for your use anywhere without having to install an application. Although the website has not changed much since I visited it ages ago (I swear it is about more than 5 years since), the good thing is that theyÃ‚Â are still providing it for free! Well, that's all for now and I will retire to bed early today in preparation ofÃ‚Â braving through myÃ‚Â inbox after not being at work for the past two days. I'll make this quick.Russell Brunson has just created a new reportand he's paying his affiliates $1 for everycopy of the report they give away.And if that wasn't enough you'll also get 50cents for each copy your referrals give away.